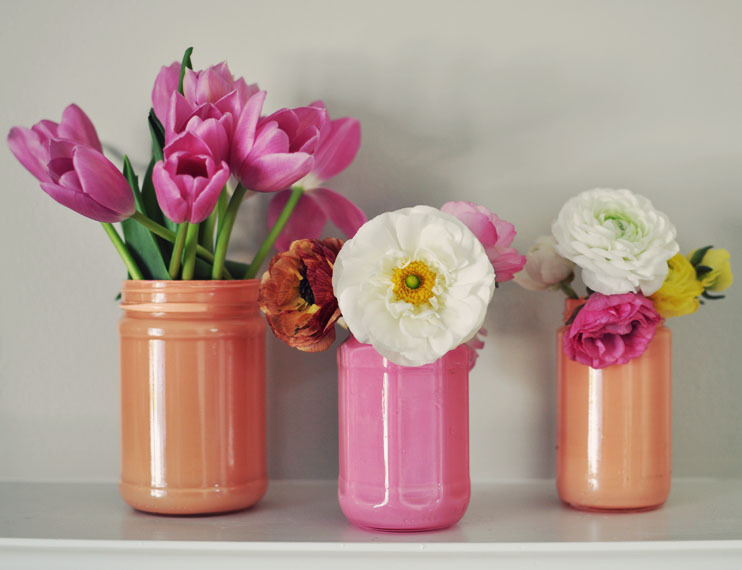 After seeing these painted jars on Pinterest, I got so excited. We have several empty glass jars saved in our garage for when my son goes to college in the fall. We are big reusers/recyclers here and he wanted them for drinking glasses in his first apartment. I also have quite a few paint samples lying around and so this was the perfect easy weekend diy. 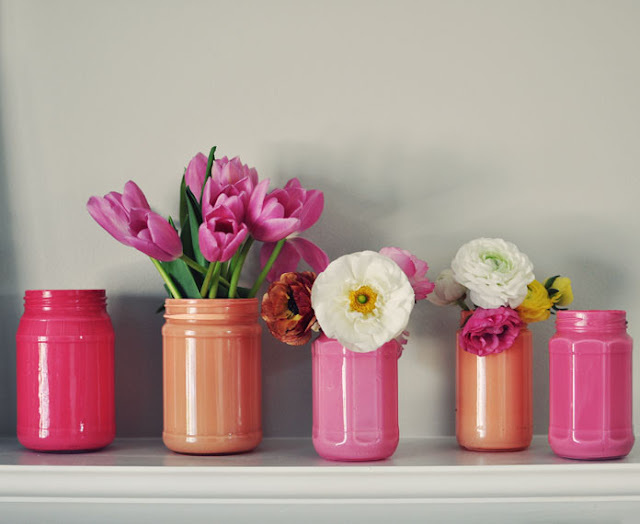 Pour a generous amount of paint into the jar. Swirl it around slowly to evenly coat the jar. Pour excess back into paint container (this can take a while). Set the containers upside-down on cardboard and let excess drip out (otherwise, you will have permanent drip marks). Move containers every 15 minutes or so, so they wont stick to the cardboard. After about 2-3 hours, you can turn them over and let them air dry. Wait at least 24 hours before you fill them with water and flowers. Edit: put a paper cup filled with water into the jar to prevent the paint from coming off (which it will do when exposed to water). Thank you, Gretchen for this brilliant suggestion! I've seen this done with glass ornaments before but never jars. It certainly highlights the simple, beautiful shapes! won't water in the jar for the flowers make the paint come off? If you're worried about the paint separating from the glass due to water (valid concern), a simple solution would be to put the flowers in a smaller cup (e.g. paper cup) before setting it inside of the glass jar. That way water doesn't get on the paint. Just a thought. or, just paint the outside! i mixed modge podge w/ food coloring and painted the outside. i have to be careful when touching w/ wet hands, but they can be used to store food since there are no chemicals inside the jar. I did nothing to the outside. It is plain glass and the paint shines through! What a pretty palette this makes! The colors you used are gorgeous. Can you tell me what the color names are? Thanks so much for sharing this craft. If you are trying to get the residue that's left from sticky labels off the jars then eucalyptus oil works a treat.